GL Communications Inc., announced today its enhanced Near Real-time Voice-band Analyzer – An analysis tool for monitoring the quality of voice-band traffic over TDM, VoIP and Wireless networks. 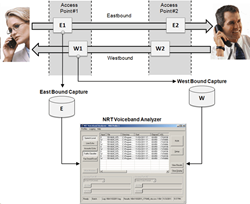 The Near Real-time Voice-band Analyzer (VBA) is a versatile analysis tool that help monitoring voice band traffic over variety of networks including VoIP, TDM, 2-Wire and Wireless. It can host an arbitrary number of analysis algorithms. Speaking to the press, Mr. Jagdish Vadalia, a Senior Manager for product development of the company said, ‘The Near Real-time Voice-band Analyzer (VBA) is a versatile analysis tool that help monitoring voice band traffic over variety of networks including VoIP, TDM, 2-Wire and Wireless. It can host an arbitrary number of analysis algorithms. He added, “The VBA application operates on previously captured files, making it a near-real time (as opposed to a strictly real-time) tool. It supports A-Law, µ-Law, 16-bit PCM (Intel), 16-bit PCM (Motorola), MS Wave, G.726 (40 Kbps, 32 Kbps, 24 Kbps, and 16 Kbps), and G.722 (64 Kbps) file formats. Mr.Vadalia further added, “The optional VBA FaxScan™ module can be used to analyze both 2-wire and 4-wire voice-band captures for Fax traffic and output fax signaling frames in a log file and fax image in TIFF format. Founded in 1986, GL Communications Inc. is a leading supplier of test, monitoring, and analysis equipment for TDM, Wireless, IP, and VoIP networks. Unlike conventional test equipment, GL's test platforms provide visualization, capture, storage, and convenient features like portability, remote operation, and scripting. Our test solutions cover wide array of networks – 4G (LTE), 3G, 2G, IP, Ethernet, T1, T3, E1, E3, OC-3/STM-1, OC-12/STM-4, and analog. GL’s tools are widely used by the telecommunication industry for: conformance testing, automated stress/load testing, and performance assessment, and analysis.